Casey, April and the TMNT are at Jones’ Grandmother’s farmhouse in Massachusetts, trying to renovate the squalid old place. April and Raph aren’t very enthusiastic about the work, but everyone pitches in with a little prodding from Casey, who’s revelling in memories of the place. Meanwhile, in the nearby city of Holyoke, we find Sid and his group of thug friends. Sid tells his cronies that he wants to pay a visit to his “psycho” cousin Casey, who’s moved into the family’s farmhouse. Don is exploring the attic of the homestead when he’s attacked by a strange, furry creature – that turns out to be Mikey in a raccoon fur coat. As Sid and his buddies drive to Northampton, Sid reveals a handgun and a plan to “scare” Casey. The trouble makers arrive at the farm and Casey greets them with no affecton. Jones tells his cousin that he’s not welcome, but Sid and his henchmen grab Casey and force their way in. Jones demands to know what this scene is all about and Sid reveals that he’s looking for $250,000.00 in cash that their Grandfather had stolen from a train back in the day. Casey denies any knowledge of the money and Sid pulls the pistol on him. 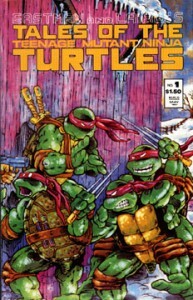 The Turtles discover the stand-off and immediately make plans to help. The mutant terrapins head out of a window and begin beeping the horn of Sid’s car. Sid sends his friends outside to investigate, and one by one the punks are taken down by the TMNT. Once the last hoodlum is out cold, the Turtles begin to beep the horn of the car once again. This distracts Sid and Casey seizes the opportunity to launch his own attack. Jones easily takes down his cousin and prepares to beat him senseless, but April cries out for Casey to stop – reluctantly, Jones ceases his assault. Casey lets Sid explain more of his story, and we discover that Sid and his father have been searching the property for years in effort to find the money. The only clue they have are the last words that their Grandfather spoke before he died, “X marks the spot.” Jones laughs off the story, but then he remembers that his Grandfather had buried his dog named Spot next to the barn, near a foundation stone that resembled a headstone. April, Sid and Casey find the spot where Spot was buried and after some investigating, Casey finds a loose stone in the foundation. He removes it and finds a small box within! As Casey removes the container, Sid snatches it from him. Jones dives into his cousin and the box goes flying. The two men race to get the package, and in their struggle, it bursts open, sending paper flying everywhere. Sid scrambles to retrieve every bit that he can. They soon discover that the paper is not cash – but notes left by their Grandmother. She had given all the money away to charity and had kept individual notes and how much went to where. April surmises that she did it in effort to make up for her husband’s crimes. Later the TMNT, April and Casey are sitting beside the fireplace inside the farmhouse, thankful that with the money gone, they’ve seen the last of cousin Sid and his friends.